Spring arrives in women’s marathon in 21 years. March. 19, 2018 07:44. by Jong-Koo Yang yjongk@donga.com. 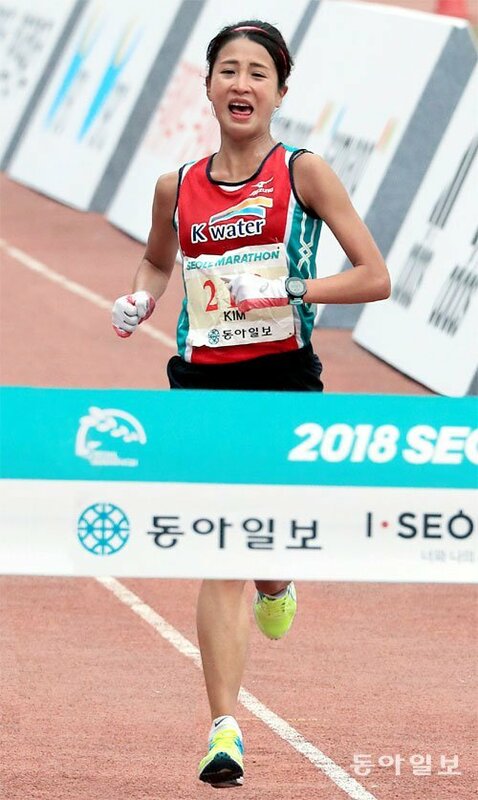 Kim Do-yeon (K-water) has renewed Korea’s best record in women’s marathon in 21 years at the 2018 Seoul International Marathon and the 89th Dong-A Marathon on Sunday. In the 42.195-kilometer full-course race starting from the Gwanghwamun Plaza to the Seoul Olympic Stadium, Kim clocked 2:25:41, 31 seconds clear of Kwon Eun-ju’s record of 2:26:12 at the Chuncheon International Marathon in October 1997. Finishing top among Korean runners and fifth in general, Kim is also expected to take part in the Asian Games held in Jakarta-Palembang in August. The 25-year-old marathoner calmly started her race behind the lead pack largely comprised of African athletes. She had initially planned to reach five kilometers in 17:20 but passed the check point in 17:07 at a faster pace. Then she reached each of the next five-kilometer stretches at a steady pace of around 17:20. While slowing down her stride in the five stretches from 25 to 30 kilometers and from 30 to 35 kilometers in 17:23 and 17:27, respectively, Kim regained her pace by clocking 17:18 from the 35 to 40-kilometer section, beating the record of Korean women’s marathon. An Seul-ki (Seoul Housing & Communities Corporation), Kim’s one and only competitor among Korean athletes, seemed to start falling behind other runners at around a 20-kilometer check point, and in the end, lost her pace completely to give up the race after running 25 kilometers. With her latest record, Kim is expected to receive around 70 million won in prize including 50 million won from the organizing committee for renewing a record, the prize money for finishing first among Korean athletes and fifth overall, and 10 million won from the Korea Association of Athletics Federations. Meanwhile, Wilson Erupe Loyanae of Kenya collected a fourth Seoul Marathon title in the men’s contest with the record of 2:06:57. Though the record falls short of his previous one of 2:05:13 in 2016, Loyanae successfully reclaimed a victory for the fourth time following 2012, 2015 and 2016. In the men’s race, Kim Jae-hoon (Korea Electric Power Corporation) clocked 2:13:24, beating his own personal best (2:17:48) by more than four minutes. Finishing top among Korean male runners, Kim has also earned a ticket to join the upcoming Asian games. In Korea’s biggest marathon festival held on Sunday, around 35,000 masters marathoners participated and ran through Seoul filled with fresh Spring air.